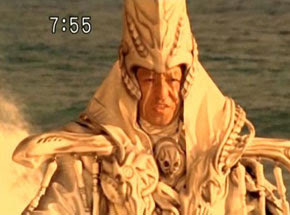 Shaddam, one of the most interesting villains in sentai history. What was his purpose really? The fact is he is the head of the Gorma Triumvirate who had long planned to overthrow his master the Gorma Emperor from the Chamber of Command. He was in fact a scheming and manipulative villain who would do anything to conquer the world and shape it as he saw it. He was also pretty much sadistic that nothing meant to him except power to the point he would harm anyone including his own family to achieve his goals. His battle with the Dairangers was certainly falling out of favor especially when the Gorma Emperor returned in episode 20 displeased by their performance. However cunning as he was, he was able to appease his emperor's wrath and the Emperor chose him to carry out the task to make sure that the Won Tiger would never be conceived over the latter's right hand man, Tenpou. 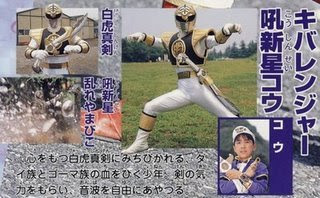 Honestly I think Dairanger as great as a series it was the one that introduced a child member of the team namely Kou who became the Kibaranger. It's really a shocker for those who watched Power Rangers' second season that Kibaranger is actually a child! Okay let's move on. He was the son of Shaddam and a Daos woman thus giving him a curse on the other half. He was born with an evil twin brother named Akomaru. While he was growing up, he realized he had a talking sword, the ability to henshin and he frequently abused his powers. He hid his identity but was later exposed. He first appeared at the same time the Gorma Emperor resurfaced to reclaim the glory of the fallen Gorma Empire. His supposed baptism purified him from the Gorma powers he had. Actually in some super sentai series, some of their mecha were really destroyed either in the middle of the series or towards the final battle. This is where destruction goes too far that if a crossover happens, I believe a second mecha was built to replace the destroyed one. Again, Power Rangers didn't start the trend of destroyed mecha, Super Sentai did although Saban's era of Power Rangers took it TOO FAR in MMPR. The Flashmen lost Flashking before the final battle. Eventually they lost Flash Titan too before finishing off the final foe Dr. Lee Keflen after the main villain was defeated. The Fivemen lost the Magmabase during the final battle against Vulgyre. Only Super Five Robo remained as Earth's last hope. The Jetmen's mecha were damaged badly after the final battle with Radiguet- apparently Jet Garuda can't be repaired assuming the parts needed are Dimensian. Tetraboy was severely dismantled by Radiguet. Eventually some people do fade away. 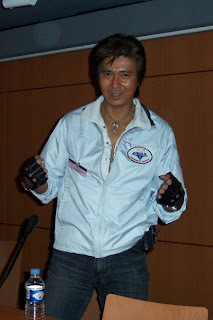 Here's a rather older picture of Ryosuke Sakomoto. Whatever he's doing lately that I don't know. I think for 2000s sentai, the Dekarangers are kind of unique in a way or cliche in another. 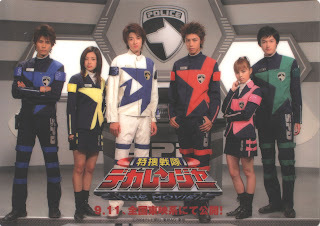 The thing is Dekaranger succeeded where JAKQ failed. Banban Akaza/Deka Red- As a leader, he is more hyped than Riki Honoo/Red Turbo of Turboranger when it comes to his ADHD. He's not very well-liked by most red ranger fans due to his rather rash behavior and he's not very typical as a sentai leader. He's the type you don't expect to appear as a leader. For more info, click here. Boukenger seems to be inspired by Jetman when it came to villain plots. While the Vyram competed among themselves, so did the Negative Syndicate and they form various small factions that compete with each other for absolute power. At times, they team up as well but betray each other. The High Priest Gaja- He is the apparently lone survivor when Gordom sank into the sea and he is apparently immortal. He was laid to sleep before but he was awakened when the Boukengers were in search for the Gordom Heart. I think he is a milder version of Tranza, both being psychics and having one arm made from inorganic materials. Appearance-wise, he does somehow resemble Black Cross Fuehrer as well. Super Sentai had robot assistants. The idea got ported for Power Rangers' Alpha Five (but he didn't exist in Zyuranger). 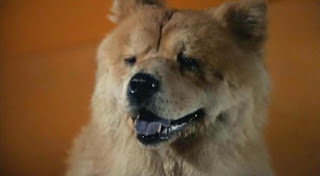 IC the Denjidog may look like a real dog but he's actually a robot from the Denji Star. The concept was also ported into the Metal Hero series Metalder. Peebo is the first humanoid one. He's a cross between Kamen Rider and C3Po. He was more of an assistant than a commander. His personality IMO would later be used for Alpha Five in Power Rangers. He's been able to cry when Mika Koizumi died in episode 10. There was MAC from Flashman who assisted the Flashmen. Colon was the first action oriented android assistant. She's also the first female assistant. Arthur G6 is the Hoshikawa family guardian. He also becomes a cannon when needed. Gogo V had Mint a cheery and child-like assistant android. He worked as an analysis android. There is also Robota from Timeranger. 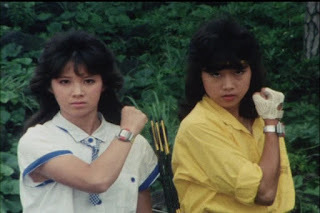 Actually there has also been "girl power" in Super Sentai. While the series started with only one female to work as the brains, later Super Sentai series started to add more than one female. One may be different than the other but they work together. Chodenshi Bioman began the classic yellow and pink team up. Mika Koizumi and Hikaru Katsuragi began as a team. 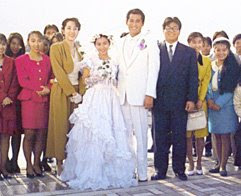 When Mika Koizumi died, Jun Yabuki took over as Hikaru Katsuragi's new constant companion. Both Mika Koizumi and Jun Yabuki were the tough girls of the team. Chageman had Sakaya Nagisa and Mai Tsubasa who could go into air and spin back to back. It was in here that Mai Tsubasa was portrayed as a tougher than usual pink ranger. Why don’t you whisper “I’m sorry” to the wind? The first rangers to use guns were the Biomen which also had a sword and short sword mode. Blue Turbo's special weapon was the J Gun which can be combined with the Turbo Laser (the same type of guns for everyone) into the amazing rifle. Later, Deka Red also had that same type of weapon. 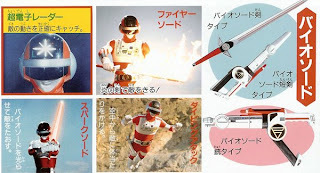 The Jetmen had two sets of guns which can combine into the Smashbomber Rifle which was temporarily used when the Jet Striker was temporarily unavailable during the fight with Glue Cockroach (who glued its wheels). Some of the later Super Sentai didn't have guns. They were Timeranger, Gaoranger and Magiranger. The Timerangers instead used giant cannons which they put together like in Flashman. The Gaorangers had no projectile based weapons either. Same for Magiranger too.